On another health note, I have been pretty successful with my plan to eat a bit healthier before I leave for Africa, but eating is not the only important part of being healthy. I have been snowboarding and climbing as well. Cook the rice according to the directions, set aside and keep warm. Stir the cornstarch into the chili garlic sauce and toss with the shrimp. Cover and let the shrimp marinate for 10 minutes. Heat the oil over medium in a skillet and add the shrimp; be sure to scrape out all of the sauce into the skillet. Saute the shrimp until mostly cooked through (about 2 minutes per side). Increase the heat to medium-high and add the chicken broth to the skillet to deglaze the pan. Continue to cook the shrimp until the broth has mostly cooked off, then toss in the basil with the shrimp. Steam the edamame in water or in the microwave until heated through (about 2 minutes). Stir the vinegar and edamame into the rice and season to taste with salt and pepper. 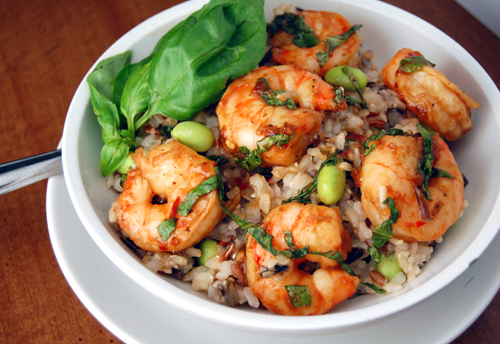 Separate the rice into 4 bowls and top with 6 shrimp each to serve. I liked you on Facebook (Alicia Hahn) and I tweeted you (@AligirlCooks)! Yum! This shrimp looks amazingly delicious! And I love edamame too, so what a great add to this dish. I discovered edamame sometime ago, and always add them to a stir fry. your stie fry looks so good, and I like the addition of the basil. Liked you on FB (Christina Nola Steeves, already a Foodbuzz friend! Liked you on FB. (Christine Driscoll). Beautiful meal! Wow what a fantastic dish! 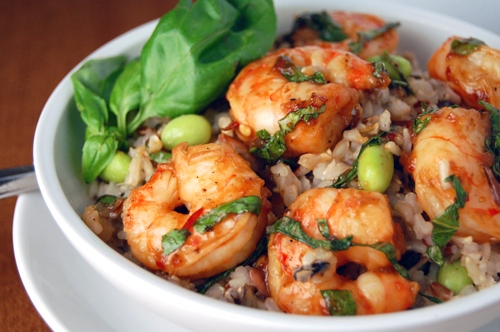 I love edamame and that chili basil shrimp looks amazing. I’m always looking for seafood recipes during lent and this just made the list! I liked you on Facebook (Rachel Levinson-Emley) and tweeted you (@rachelouise18). What a delicious-looking recipe! Love the colors! That dish looks incredible!! Thanks for your nice receipes. Your dish looks fantstic. I need to give the edamame another chance. I’ve only had it once and the recipe called for it to be mashed. None of us liked it. Mixed in with your rice, shrimp and herbs would make a huge difference, I bet. It looks tasty that way. This sounds so fantastic! Thanks for sharing! This recipe looks awesome. Nice post. I love this recipe: both the combination of chili with garlic, if the sauce is made without wheat-brewed soy sauce, it can be 100% gluten free. I’m following you on Twitter (I’m inopenmarketing), if you follow me I could message you on reducing gluten, but I think you’re already on your way there. Happy travels in Africa! Made this tonight for dinner, it’s excellent! The only thing is, I was disappointed with how little sauce was left over to top the rice. I followed you on Facebook but the link for Twitter came back as not found. I searched you on Twitter and got the same results. I think I am going to make it for my daughters birthday dinner.